Chicory root-64.6% fiber by weight 9.3 grams (~1/3 ounce)-can be found in health food stores and commonly used in the south as a replacement for coffee. Jerusalem Artichokes-31.5% fiber by weight 19 grams (~3/4 ounce)-Not actually an artichoke, but a Sunchoke a root like vegetable, has the potential to create stomach upset, so consume sparingly. Asparagus-5% fiber by weight 120 grams (1/4 pound)-Steamed, grilled or roasted, a lightly flavored vegetable. Garlic-17.5% fiber by weight 34.3 grams (1,2 ounce)-Best consumed raw, add it to salad dressings, salsa or hummus. Onions-8.6% fiber by weight 120 grams (1/4 pound)-Onions have the same potential whether cooked or raw so enjoy in abundance! Dandelion greens-24.3% fiber by weight-Try instead of your regular salad greens or lightly steamed with a drizzle of olive oil. They have a very mild flavor. Leeks-11.7% fiber by weight 51.3 grams (1.8 ounce)-Closely related to onions and garlic, The can be used in a similar way to onions. Make sure you split them and rinse very well, as they can have lots of dirt and grit within the stalk. Raw Wheat bran-5% fiber by weight 120 grams (1/4 pound)-Also found in health markets and now more readily available, can be sprinkled in your morning smoothie or yogurt parfait. Cooked Wheat flour-4.8% fiber by weight-make sure the grains are 100% whole wheat. The food we consume has power and adding prebiotics to your daily routine is a healthy way to strengthen your GI tract and your immune function. Add small amounts at a time, as prebiotics in large doses can create some gas and bloating as your body adjusts to the new foods-but this passes and is rare. 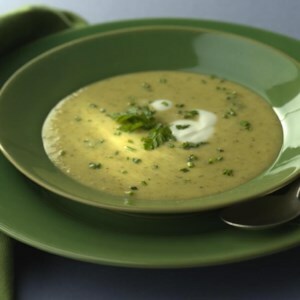 Like a bouquet of fresh vegetables, this light but soothing soup is just the thing on a cool spring evening. It is important to cut the green vegetables into small pieces so they cook quickly, while retaining their bright color. Heat oil in a large saucepan over medium-low heat. Add leeks and cook, stirring often, until softened but not browned, about 5 minutes. Add garlic and cook, stirring, for 1 minute. Add potatoes and broth; bring to a simmer over medium-high heat. Cover and reduce heat to medium-low. Simmer, stirring occasionally, until the potatoes are tender, 10 to 15 minutes. Return the soup to the pan. Add milk and bring to just below a simmer, stirring, over medium heat. Stir in lemon juice, salt and pepper. Ladle into soup bowls. Garnish each serving with a dollop of yogurt, a sprinkling of the remaining chopped chives and a sprig of chervil (or parsley). Ingredient Note: Chervil (from the Greek for “herb of rejoicing”) has a mild flavor between those of parsley and anise. It doesn’t dry well, so is best used fresh.